Chapel-en-le-Frith Parish Council wants to ensure that local people are involved in the choices that will help to shape our neighbourhood. This Neighbourhood Plan sets out a vision for the area that reflects the views and feelings of local people with a real interest in their community. It has been produced, after much public consultation, on behalf of Chapel-en-le-Frith Parish Council by Chapel Vision – a volunteer group of local residents from across the Parish. This Neighbourhood Plan has been compiled following an examination of local housing, employment opportunities, including tourism, town and village centres, sustainable transport movement and the countryside within the Parish. The Neighbourhood Plan includes a number of policies for each of these areas, which are discussed within the Plan and listed in Appendix 1. 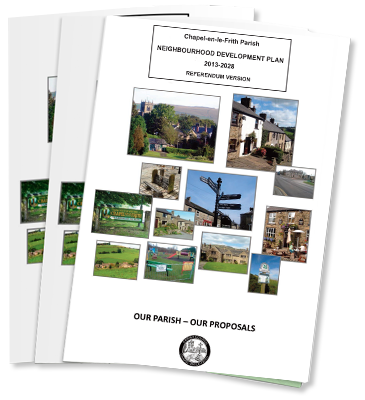 These policies are based on evidence collected by Chapel Vision in the research phase of the compilation of the Neighbourhood Plan, which includes the views of the public.